Durable, weather resistant construction. For landscape and holiday lighting. Green with a 6' SJTW 18 gauge green cord and ground stake. cULus Listed. High impact, weather resistant. Green plastic. 18/2 SJTW 8' green cord. Wall mount and ground stake included. 120 volt, uses 150 watt maximum, par 38 bulb, not included. Polybagged. UL Listed. Locking swivel knuckle for positive lamp positioning and pin-point directional aiming. Die cast construction, powder coat finish. For 75-150 watt maximum, Par-38 type lamps, (not included). 15 amp/125 volt, 3 wire cord set included. Does not include mounting plate. Gray color. cULus Listed. Shrink wrapped. Test auto and manual modes, adjustable time delay, (10,5,1 minutes). Manual override at the light switch. Includes protective rubber gaskets for lampholders and round cover plate that adapts to existing electrical boxes. Adjustable infrared sensor range of up to 50 feet. Flood lights not included. Patented ScanGuard lens with protective hood to shield infrared lens from sun, rain and snow. Energy saving photocell. Adjustable floodlight fixtures. 110 degree detection zone. UL Listed for use in wet locations. Test auto and manual modes, adjustable time delay, (10,5,1 minutes). Manual override at the light switch. Includes protective rubber gaskets for lampholders and round cover plate that adapts to existing electrical boxes. Adjustable infrared sensor range of up to 50 feet. Flood lights not included. Patented ScanGuard lens with protective hood to shield infrared lens from sun, rain and snow. Energy saving photocell. Adjustable floodlight fixtures. 110 degree detection zone. UL Listed for use in wet locations. Test auto and manual modes, adjustable time delay, (10,5,1 minutes). Manual override at the light switch. Includes protective rubber gaskets for lampholders and round cover plate that adapts to existing electrical boxes. Adjustable infrared sensor range of up to 50 feet. Flood lights not included. Patented ScanGuard lens with protective hood to shield infrared lens from sun, rain and snow. Energy saving photocell. Adjustable floodlight fixtures. 110 degree detection zone. UL Listed for use in wet locations. Rectangular light kit. Includes 2 die-cast aluminum lampholders with rectangular zinc box and cover, gaskets, screws, mounting lugs and closure plugs. For use in wet, damp, or dry locations. Uses 2 Par-38 lamps, 75-150 watt maximum, not included. UL Listed. Boxed. Rectangular light kit. Includes 2 die-cast aluminum lampholders with rectangular zinc box and cover, gaskets, screws, mounting lugs and closure plugs. For use in wet, damp, or dry locations. Uses 2 Par-38 lamps, 75-150 watt maximum, not included. UL Listed. Boxed. 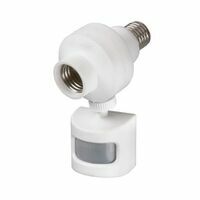 Includes two die-cast zinc lampholders, with round zinc box and cover, gaskets, screws, mounting lugs and closure plugs. For wet locations. Use Par-38 lamps, 75-150 watt maximum, not included. UL Listed. Boxed. Replacement motion sensor for security lights, requires 120-volts AC, 60 Hz. Test, auto and manual operating modes. For manual mode, the control must be wired through a switch. Turns on lighting when motion is detected. Automatically turns lighting off with time delay of 1, 5 or 10 minutes. Photocell keeps the lighting off during daylight hours. LED indicates motion was sensed (day or night). Resets to auto mode at dawn. Adjustable range up to 70 ft., varies with surrounding temperature. Sensing angle up to 180 degrees. Electrical load up to 500 watt maximum incandescent. Replacement motion sensor for security lights, requires 120-volts AC, 60 Hz. Test, auto and manual operating modes. For manual mode, the control must be wired through a switch. Turns on lighting when motion is detected. Automatically turns lighting off with time delay of 1, 5 or 10 minutes. Photocell keeps the lighting off during daylight hours. LED indicates motion was sensed (day or night). Resets to auto mode at dawn. Adjustable range up to 70 ft., varies with surrounding temperature. Sensing angle up to 180 degrees. Electrical load up to 500 watt maximum incandescent. Die-cast aluminum with rectangular zinc cover and box, for wet locations. Gaskets, screws, mounting lugs and closure plugs included. Par-38 lamps, 75-150 watt maximum, not included. UL Listed. Die-cast aluminum with rectangular zinc cover and box, for wet locations. Gaskets, screws, mounting lugs and closure plugs included. Par-38 lamps, 75-150 watt maximum, not included. UL Listed. Features sensitivity/range adjustment, test auto and manual modes, adjustable time delay, (10,5,1 minutes). Manual override at the light switch. Includes protective rubber gaskets for lampholders and round cover plate that adapts to existing electrical boxes. Adjustable infrared sensor range of up to 70 feet with a sensing angle of 150 degrees. Installs with just a screwdriver. Flood lights not included. LED compatible. UL Listed. Replacement motion sensor for security lights, requires 120 volt AC, 60 Hz. Pulse Count technology reduces false sensing from wind and rain. 2 level lighting, low-level accent light adjustable timer settings include off, 3 hour, 6 hour, and dusk to dawn, and full bright when motion is detected. Automatically turns lighting off with time delay of 1, 5 or 10 minutes. Automatic photocell deactivates unit in daylight to save energy. Manual override turns light on or off when wired with a wall switch. Allows light to stay on continuously all night when needed. Range can be adjusted from 15' up to 100', varies with surrounding temperature. Sensing angle of 240 degrees. Replacement motion sensor for security lights, requires 120 volt AC, 60 Hz. Pulse Count technology reduces false sensing from wind and rain. 2 level lighting, low-level accent light adjustable timer settings include off, 3 hour, 6 hour, and dusk to dawn, and full bright when motion is detected. Automatically turns lighting off with time delay of 1, 5 or 10 minutes. Automatic photocell deactivates unit in daylight to save energy. Manual override turns light on or off when wired with a wall switch. Allows light to stay on continuously all night when needed. Range can be adjusted from 15' up to 100', varies with surrounding temperature. Sensing angle of 240 degrees. Features sensitivity/range adjustment, test auto and manual modes, adjustable time delay, (10,5,1 minutes). Manual override at the light switch. Includes protective rubber gaskets for lampholders and round cover plate that adapts to existing electrical boxes. Adjustable infrared sensor range of up to 70 feet with a sensing angle of 150 degrees. Installs with just a screwdriver. Flood lights not included. LED compatible. UL Listed. Features sensitivity/range adjustment, test auto and manual modes, adjustable time delay, (10,5,1 minutes). Manual override at the light switch. Includes protective rubber gaskets for lampholders and round cover plate that adapts to existing electrical boxes. Adjustable infrared sensor range of up to 70 feet with a sensing angle of 150 degrees. Installs with just a screwdriver. Flood lights not included. LED compatible. UL Listed. Features sensitivity/range adjustment, test auto and manual modes, adjustable time delay, (10,5,1 minutes). Manual override at the light switch. Includes protective rubber gaskets for lampholders and round cover plate that adapts to existing electrical boxes. Adjustable infrared sensor range of up to 70 feet with a sensing angle of 150 degrees. Installs with just a screwdriver. Flood lights not included. LED compatible. UL Listed. Outdoor motion activated light control with selectable off times. Turns on when motion is detected, off at user programmed time, 1 / 2 / 5 / 10 or 20 minutes. Fixed position switch retains setting in the event of a power outage. 180 degree sensing window, 30' detection zone. Ball joint for full adjustability, up/down/left/right. Spring loaded contact for full 360 degree rotation. Compatible with compact fluorescent, LED, halogen and incandescent floodlights. Wall or eve mounted, must be mounted horizontally. Adjustable sensitivity. Selectable light timer, test, 1 minute, 5 minutes or 10 minutes. 110 degree sensing angle. Manual override turns light off or on with existing indoor wall switch. Allows light to stay on continuously all night when needed. Up to 60' range. Uses one 150 watt quartz bulb, included. Westek Motion Activated Light Control, Dual Function, Programmable, Suitable For Use With: CFL, Halogen and Incandescent Floodlights, 150 W, 180 deg Detection Zone, White, For Outdoor Security - Driveways, Yards and Alleyways Portable plug-in motion light. 100 watt halogen floodlight, bulb included. 8' electrical cord. Die-Cast metal fixture with plastic handle and motion sensor detects motion 180 degrees and up to 60' range. Indoor/outdoor use. UL and CUL Listed for wet locations. Wall mount only. Senses heat images from objects such as people, large animals and automobile engines. When motion is detected the light will automatically turn on. Once motion has stopped the light will turn off after a preselected time delay. May also be used as a standard floodlight. For use only on GFCI protected circuits. For maximum bulb life, position fixture so the quartz halogen bulb remains within 4 degrees of horizontal. Dusk-to-dawn operation. Up to 3,000 square foot light coverage. Uses 1 bipin CFL, 13 watt bulb, included. Up to 10,000 hour bulb life. Operating temperature: -13 to 120 degrees F. Wires are AWG number 18. UL Recognized. Wall or eve mounted, must be mounted horizontally. Adjustable sensitivity. Selectable light timer, test, 1 minute, 5 minutes or 10 minutes. 110 degree sensing angle. Manual override turns light off or on with existing indoor wall switch. Allows light to stay on continuously all night when needed. Up to 60' range. Uses one 150 watt quartz bulb, included. LED wall pack ground mount kit converts the 12W and 19W ALL-Pro LED wall packs into floodlight luminaires for ground or wall mount applications. Slim-profile, durable. Easy to install trunnion base. Supplied with 12" electrical whip. Wet location rated for outdoor use. Motion sensor turns on light when motion is detected, automatically turns light off after time delay of 1 , 5 or 10 minutes. Adjustable sensitivity. Built-in photocell keeps the light off during daylight hours. Test, auto and manual operating modes. Manual override turns light off or on at indoor wall switch, allows light to stay on continuously all night when needed. Coverage area up to 1,000 square feet, up to 30' range, varies with surrounding temperature. Sensing angle up to 110 degrees. Controls 60 watts maximum of incandescent light. 120 volt AC, 60 Hz. Includes mounting hardware. Daylight shut-off. Selectable walk test. Automatic power outage reset. Sensitivity adjustment. Patented swivel adjustment. Selectable light timer 1, 5 or 10 minutes. Manual override. Operating temperature-minus 22 degrees Fahrenheit to plus 120 degrees Fahrenheit. Instant on operation. Durable metal fixture. Tempered glass. Wall or eave mountable. Clip-on lens. 150 degrees wide angle lens. 70' sensor range. 250 watt quartz halogen bulb included. 6,400 square foot sensor coverage. Powder coat finish. Unique dimpled design reflector and custom lens design. Daylight shut-off. Selectable walk test. Automatic power outage reset. Sensitivity adjustment. Patented swivel adjustment. Selectable light timer 1, 5 or 10 minutes. Manual override. Operating temperature-minus 22 degrees Fahrenheit to plus 120 degrees Fahrenheit. Instant on operation. Durable metal fixture. Tempered glass. Wall or eave mountable. Clip-on lens. 150 degrees wide angle lens. 70' sensor range. 250 watt quartz halogen bulb included. 6,400 square foot sensor coverage. Powder coat finish. Unique dimpled design reflector and custom lens design.